You might remember that we discussed the first volume of the Atlas Shrugged film trilogy a while ago, mostly focusing on the fact that the director appeared on several episodes on the original 90210. Well, it's Rand time at the El Con theater! Be forewarned, the liberal media is already sharpening their razor wit to take down this filmed assault on collectivism, with only 6% positive reviews according to Rotten Tomatoes, with Rolling Stone's Peter Travers commenting that "Ayn Rand's monumental 1,168-page, 1957 novel gets the low-budget, no-talent treatment and sits there flapping on screen like a bludgeoned seal." Honestly, I tried to find a largely positive review from a legit source, but even Reason Magazine, which seems like the ideal audience for such a film, called it "like watching early rehearsals of a stage play that’s clearly doomed." Caveat emptor, but now I'm sort of wanting to see it, mostly because I like trains. GIVEAWAY: Pool Party with Nemo! 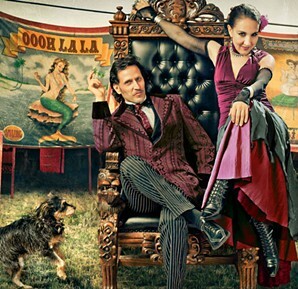 Carnival of Illusion: Magic, Mystery & Oooh La La!